Right from the start here, I should admit to my bias for NuCanoe. I’ve always liked the hybrid canoe and kayak design for its simplicity and dependable performance. The original NuCanoe was designed by Tim Niemier, the millionaire beach bum credited with inventing the sit-on-top kayak. 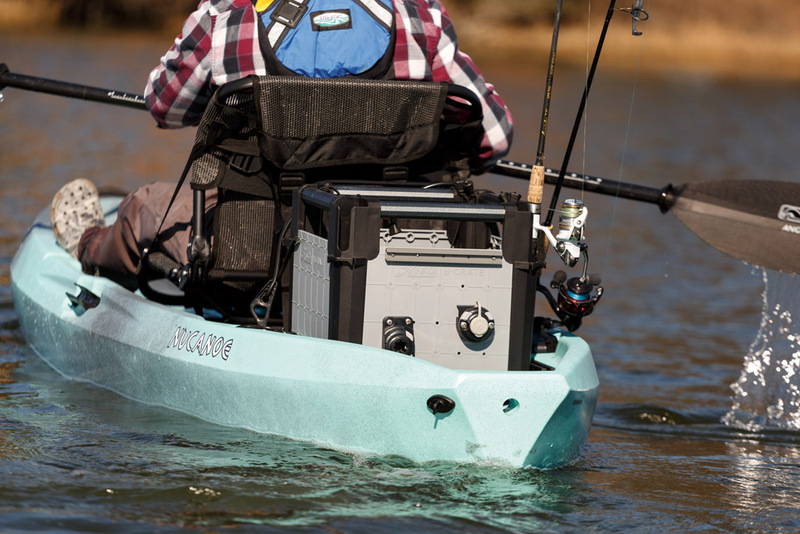 So What Does NuCanoe’s Flint Hybrid Fishing Kayak Have To Offer? 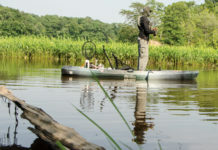 Like a mad scientist, Niemier wanted a fishing kayak combining the low-profile hull of a kayak with the utility of an open canoe. The result was the Classic, a sit-on-top kayak with an accessible cockpit from bow to stern and what has become NuCanoe’s signature shape. Since then, NuCanoe has added the full-featured Frontier with gear tracks, rod holders, anchor system and other fishy finishings. Next, came a long-distance hauler, the Pursuit, offering a slimmer profile and longer waterline to cover open water. This year, to get in on the old-is-new-again trend of lighter, more affordable kayaks, NuCanoe introduced the Flint to their lineup. When I pointed out the similarities to other boats in the family, Young laughed and admitted the resemblance. “Our starting point for the Flint was combining the simplicity of the Classic with the features, deck and hull design of the Frontier and Pursuit.” When he told me the price was below $1,000, I was the one laughing. In my experience, a bargain boat isn’t usually worth the savings. Responding to my skepticism, Young pointed out the smart details and quality construction. “We kept the price low by leaving out removable pods and large hatches most anglers don’t use,” Young explained. He said this puts the focus on fishing and away from gadgets. The Flint also benefits from economies of scale, borrowing parts from the Frontier and Pursuit. “The only part unique to the Flint is a side handle doubling as a paddle holder,” Young said. We hope they’ll include this cool touch on their other boats. NuCanoe fans will recognize the horizontal rod tubes, tackle box storage, gear tracks and stern and bow handles borrowed from the Frontier and Pursuit. NuCanoe also carried over the custom height adjustment Pinnacle seat but stripped down without the 360-degree mobility feature found on other models. Just like the Frontier and Pursuit, the Flint’s seat is mounted on gear tracks, so it slides fore and aft to adjust for leg length and trim. In the bow, there’s a molded-in channel to hold a measuring board. Young also added a small, round hatch to make the Flint easier to rig with NuCanoe’s pedal system released earlier this year. “One of the biggest challenges was designing a stiff floor without internal supports,” Young admitted. Instead, to keep weight down NuCanoe used scuppers, channels and other design elements to reinforce the rigid deck. These features also help the deck to drain quickly, something anglers fishing choppy water will appreciate. To get the short Flint to slide through the water at a comfortable pace, Young’s team spent months designing the hull. “We went through three rounds of fiberglass prototypes and two rotomolded prototypes before we settled on the final design,” he told me. The challenge was making the boat super stable and still tracking straight in rough water. They settled on a waterline just over 11 feet long, short enough to slide in a pickup bed and store in the garage but long enough for tracking and speed. A wide 33-inch beam keeps the boat stable, even when standing on the bow or back in the stern. The primary stability is a little loose, which improves paddling performance by allowing the boat to roll over waves without getting knocked around. Good thing the secondary stability is rock solid. I could shift my entire weight to one side of the kayak without going over. At only 73 pounds, the Flint will bob over river rocks and bounce down backwoods trails, something tougher to do with the heavier Frontier or Pursuit and other models in the big boat category. When we received one of the first Flints off the production line, I took the boat to my favorite backwater creek. It was easy to wheel two hundred yards down a bike path and lower 10 feet down the bank to the low-tide mud. The real beauty comes when fishing close quarters. Striped bass, speckled trout and redfish often congregate in deep holes where two creeks meet. Many times, the space isn’t large enough to accommodate let—alone maneuver—a full-size kayak. I could position the Flint anywhere in the confluence and stand and fish channel drops and dock pilings. When I was paddling on my feet and fighting a fish, I didn’t have to wrestle the boat into position. 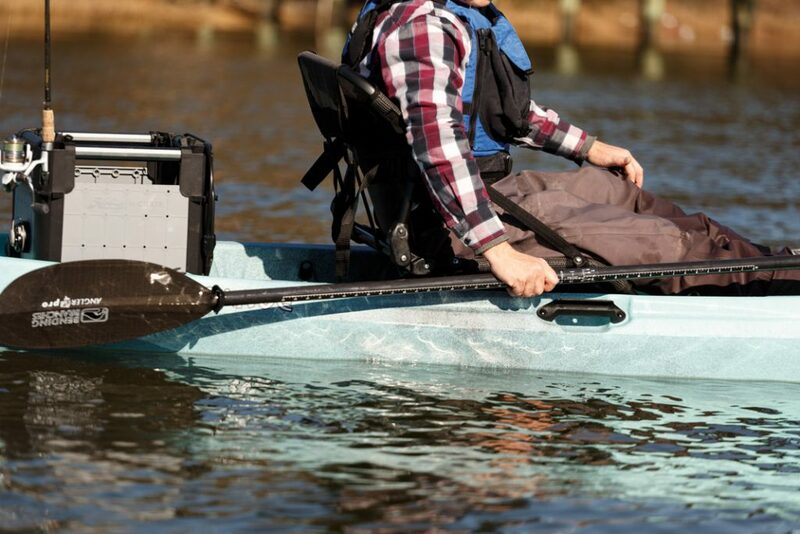 It’s just an easy handling kayak, whether standing or sitting. Once again, NuCanoe has captured the utility of a canoe with the performance of a kayak, this time in a simpler and less expensive package and without cutting back too much comfort or too much convenience. The Flint borrows our favorite features from the NuCanoe family of boats and adds some cool new touches. The only thing missing is another decimal point on the price tag. Follow us @kayakanglermag to find all your fishing gear needs. 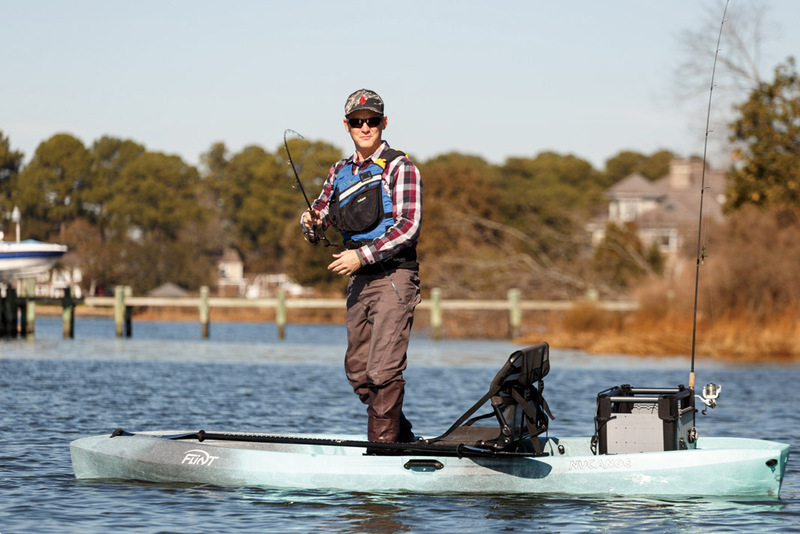 Next articleIs It Better To Paddle or Pedal While Kayak Fishing?